Bringing in the tree on Christmas Eve and preparing dinner was a lot to do in one evening especially with six very excited children. But Mom! But Dad! everyone else has a tree! It was a form of torture. Gradually we began bringing the tree in and trimming the tree earlier – but there were no lights. Secondly, lighting the tree took precautions – a bucket of water or two, everyone had to sit in their seats and not move . . . then the candles were put out soon after lighting. Lighting the tree because it was so dangerous was a big issue. One year, we added white lights. Our tradition had changed. So, lights it was – and candles! But also, over the years, there has been quite a bit of social and cultural change in the world. Attitudes about fire safety and candles on trees were far different one hundred years ago. The desire to play and frolic seems to be a heritage of mankind. In infancy and early childhood this joy and exuberance of spirit is given full sway. In youth, that effervescent stage of human existence, “joy is unconfined.” But in middle age and later life we are prone to stifle this wholesome atmosphere of happiness, with care and worry and perhaps, when a vexed or worried feeling has been allowed to control us, even forbid the children to play at that time. Why not reverse things and drown care and strife in the well-spring of joy given and received by reviving the latent spark of childhood and youth; joining in their pleasures passively or actively and being one of them at heart. I understand her concerns. We are constantly on the move in this century – we live, as they say, to work. And we fret and worry about everything. Including fire safety. To wit, Ms. Blain outlines a game in which the children are blindfolded, spun around and then asked to blow out candles on the tree! Or another one of my favorites, Ms. Blain suggests putting jack-o-lanterns on the orifices of a gas fireplace. This must have been a spectacular way to light up the pumpkins! How many of us would attempt either of these “games” with children in the room – or not? Why wasn’t she worried? Have things changed so much? Yes, things have changed. One hundred years ago, young ladies and their mothers made Christmas ornaments. 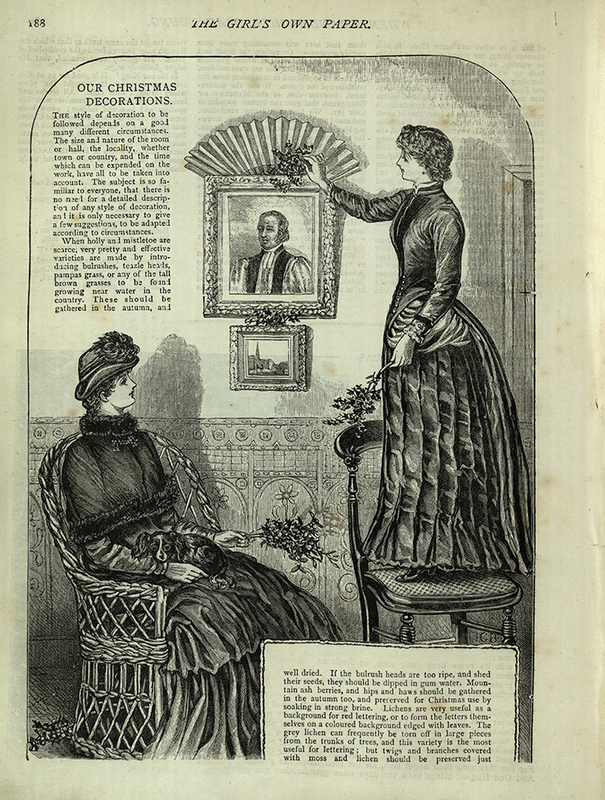 The beautiful tussle-mussies, fans and paper craft favored by the Victorians must have demanded time to craft. 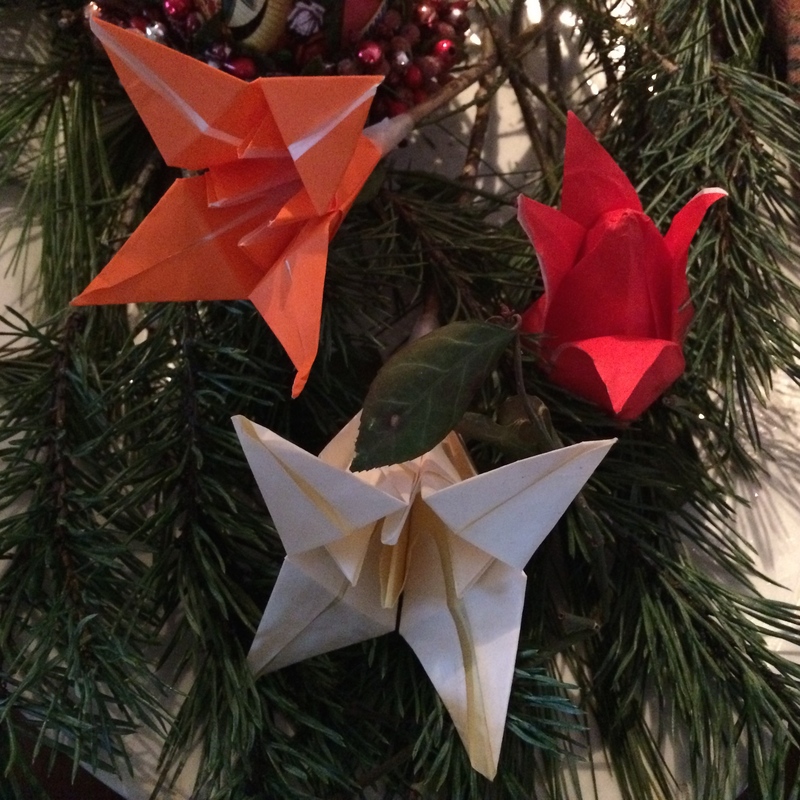 Hand crafted ornaments are simple but precious . . . so are handcrafted presents! Time has speeded up. Now we run around at Christmas looking for the perfect present – after work for many of us. The candles on the tree have long disappeared. Now tree trimming follows Thanksgiving or even Halloween. I can imagine my husband saying, Phooey, how ridiculous. He was a breed apart – I miss his old fashioned ideas and traditions. He passed on fifteen years ago. A lot has changed since then too. He would love to see the new ornaments that grace the pine boughs on our old pine top table. . . they were hand crafted by our grandson. He would be happy that the tree is not yet trimmed; nor are the presents wrapped. I will not have candles on the tree though; they are so beautiful, but dangerous! Now, if only I could stop stressing about the long list . . .